• Professor Emeritus Kjell Härenstam has been engaged in studies of religion in North India. His field of studies concerns the didactics of religion, especially Tibetan Buddhism. By bringing students to India, to Varanasi and Dharamsala, and discussing their experiences Kjell also gets a direct feedback into his research. He has been connected to Karlstad University since 1974 and has, along with colleagues, been instrumental in creating a teaching and research centre emphasising World religions besides Christianity, such as Islam and Buddhism. He defended his doctoral dissertation in 1993 on an analysis of how Islam is portrayed in Swedish school books, ”Textbook Islam: An analysis of the image of Islam in Religious Education Textbooks” (Acta Universitatis Gothoburgensis). Kjell Härenstam has continued to study the issue of didactics of religion and intercultural learning in an International context, and is a member of EAWRE (European Association for World Religions in Education). In 1996 he participated in the German anthology ”Dialog der Religionen im Unterricht. Theoretische und praktische Beiträge zu einem Bildungsziel” with a text on ”Thematische Studien zu den Weltreligionen in der Ausbildung von Lehrern und Lehrerinnen”, and has in recent years been involved in an International initiative on implementing helpdesks for intercultural learning materials in Europe. Kjell Härenstam was a member of SASNET’s board during the period 2004-06. Marc Katz, retired in 2013, has been engaged in research in the eastern part of Uttar Pradesh, India. His dissertation in 1993 had the title: ”The Children of Assi. The Transference of Religious Traditions and Communal Inclusion in Banaras”. In his research Dr. Katz has focused upon the importance of ”communal-inclusive” traditions. He has also been very much in favour of using documentary films as part of his research. He has produced three films on religion in Banaras/India, which are distributed through The Center for South Asia, at University of Wisconsin, Madison (more information on this). • Holi Hey: A Festival of Love, Color, and Life, showing how the annual north-Indian Spring festival of Holi is celebrated in the city of Banaras. Mahant Veer Bhadra Mishra (photo to the right), spiritual leader of the famous temple of Sankat Mochan Hanuman in the Holy City of Banaras, recounts several explanations for the Holi festival. The film dramatizes how once each year the Holi festival unites neighborhoods, breaches the barriers of age, caste, social rank, and religious afiliations, and calls on all to share in unity and merriment. • Tulsidas and the Fire of the Veda, from 1999, in which Mahant Veer Bhadra Mishra, explains the symbolism of the performance of Yagya. He illuminates the threads of Indian tradition which bind together the rituals of the Veda and the performances of Bhakti: the Katha story-telling, the chanting of texts, Bhajan and Kirtan, and the Lila dramas of the Avatar Ram and Krishna. In 2004 Marc Katz completed a new film, ”Banaras Muharram and the Coals of Karbala”, dealing with the celebration of Muharram in Varanasi, the main festival of the Shia Muslims, but in which also both Sunni Muslims and even Hindus take part. It narrates the classical Muharram story and includes thoughtful interviews with Banarsi Muslims, powerful scenes of Shi’ite worship (including self-wounding), elaborate tazia processions, and scores of young men firewalking (fire-running) through the ”coals of Karbala”. The film was released at the 33rd Annual Conference on South Asia held at the University of Wisconsin-Madison 15–17 October 2004. More information on the film. In February 2006 Dr. Katz received a SASNET planning grant for a project called ” The Vitality and Role of ‘Sporting Clubs’ in the Multi-Cultural Community: A Study of the Traditional Youth Organizations of Banaras” focusing on the organized youth clubs prevalent in Varanasi, that often express respect and appreciation for the multi-cultural (and multi-caste) flavour of the city. The ”organizing committees” of the youth mandal, for instance, demonstrate a conscious effort to maintain a multi-cultural presence in the committee and thereby represent all the jati and cultural spheres of the neighbourhood (muhalla). A study of the mechanisms working for both maintenance and erosion of this longstanding system of organized youth groups is of interest to both students of History of Religion and Peace and Conflict Resolution. Major focus will be put upon the activities of the Sarasvati Pujas of 2006 and 2007, but activities of the youth groups throughout the year and organized around other rituals will also be examined. The research project is carried out in collaboration with Dr. Priyankar Upadhyaya, Director & Professor of Peace Studies, Malaviya Centre for Peace Research (MCPR), Faculty of Social Sciences, Banaras Hindu University. PhD candidates at the MCPR are trained and supervised by Katz and Upadhyaya and conduct the field research in ten localities (muhallas) spread throughout the city of Banaras. The project received a new SASNET grant in August 2006 for continued planning. In November 2006 the Institute for Interreligious Studies in Germany gave Dr. Marc Katz the 2006 INTR°A Project Award. The award, 5,000 Euro, is designed for individuals, groups or institutions that promote the complementation of the religions in word and deed. Dr. Katz gets the award for for his research of ways of religious life and his teaching on interreligious and interconfessional encounter through the means of film. The motivation says that ”his genuine, empathetic and instructive procedure is particularly convincing represented in the films Banaras Muharram and the Coals of Karbala and Tulsidas and the Fire of the Veda, developed and produced by Professor Katz together with Staffan Winbergh”. 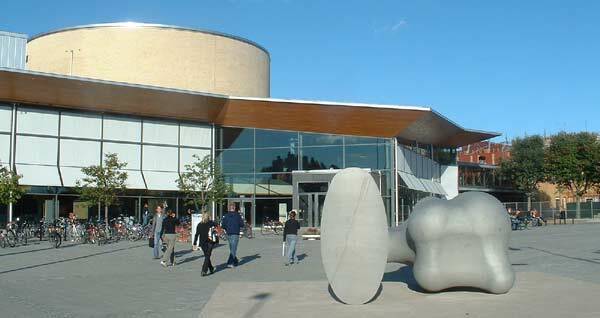 The award was handed over during the INTR°A conference, held 17–19 November 2006 in Iserlohn, Germany. Prof. Veer Bhadra Mishra from Sankat Mochan Foundation hands over the prize to Dr. Marc Katz for his efforts to encourage the age-old cultural traditions of Varanasi in tune with current environmental needs on November, 4, 2007. • Together with the biologist Eeva Lakomaa, Marc Katz has also engaged in the Swatcha Ganga Project, which has been set up to clean the Ganges River. They have collected funds and set up a laboratory for analysing the water in the river. They planned for a website to present regular information about the sanitary situation. MFS students have done fieldwork in this project. Funds have come from Sida and from ‘Svenska Naturskyddsföreningen’. 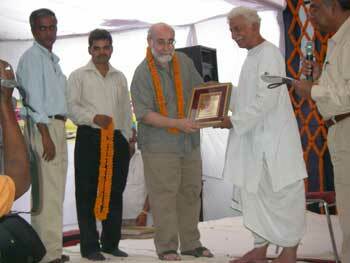 On 4 November 2007, Dr. Marc Katz received an award for his “work for Ganga and promotion of the ideals of SMF”, at a ceremony in Varanasi, in connection with the jubilee of Sankat Mochan Foundation (see photo to the right). The vision of the SMF foundation is to restore the Ganges by alleviating its fast deteriorating environmental conditions; to promote education and health care programs for the less privileged; and maintain and encourage the age-old cultural traditions of Varanasi in tune with the current environmental needs. Dr. Katz was also praised for his film works dealing with Varanasi. It was mentioned that “The Children of Assi” has recently been reprinted and released by Pilgrims Publishing House, Varanasi (with a new index and color photographs). 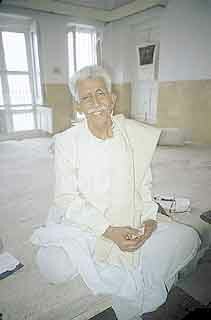 Professor Veer Bhadra Mishra passed away in early March 2013. More information. Dr. Katz participated in the SASNET workshop on ”The role of South Asia in the internationalisation of higher education in Sweden” held in Stockholm 28-29 November 2006, where he gave a presentation about Karlstad University Teachers training and other educational activities in Banaras and Dharamsala in the session about ”Sending students to South Asia”. He was also an invited speaker in the final panel discussion titled ”Best strategies for marketing Higher Swedish Education in South Asia, and for sending students to Higher Education in South Asia?” More information about the workshop. Every Autumn Karlstad University and Banaras Hindu University offers 10–14 duly admitted students to the C/D-level courses (20 credits) in History of Religions, History and Cultural Geography at Karlstad University (if meeting basic requirements for studies in India), the opportunity to spend 10–15 weeks in Banaras (Varanasi). In India they study languages (Hindi/Sanskrit), conduct individualized litterature and field studies (related to their C/D thesis topics) under qualified supervision, and participate in a joint BHU-Karlstad University seminar on the ”Multi-Cultural Aspects of Banaras”. More information on the India Programme. More information on Karlstad University´s education connected to South Asia. Read also Lars Eklund’s report from the Swedish Study Centre at Varanasi in March 2002.